Shiv Chopra was born in India. He was 13 years old when independence from Britain was achieved amidst the blood bath of ‘Partition’ and Gandhi’s assassination. After obtaining his degree in veterinary medicine in India, he also received a Ph.D. in microbiology from McGill in the 60s and became a drug and vaccine evaluator for Health Canada in 1969, joining its veterinary division in 1987. There, he observed with increasing alarm the systemic corruption of Canada’s health policy as the federal government put increasing pressure on him to approve drugs that were already known to be harmful. Yet he stubbornly insisted on the safety studies and tests that Canadian law requires before he would approve these veterinary drugs. These antibiotics and growth hormones, used to increase the weight and size of food animals to increase profit, are not metabolized/detoxed out of the animal, but instead wind up being ingested by people who eat this meat. Because consumers cannot metabolize them either, their health is compromised and drug residues end up passing through their urine and into the public water supply. They also contribute to antibiotic resistance. After observing the corrupt drug approval process present in his department, Dr. Chopra decided not to keep quiet and he began to blow the whistle: That’s when Canada received a hefty dose of Gandhi’s political philosophy. Gandhi summed it up in the Sanskrit word satyagraha (grounding in truth). Not only corruption is infectious, but satyagraha is too. Shiv received support not only from his immediate colleagues, Drs. Margret Haydon, Gerard Lambert, and others, but more than 200 Health Canada scientists wrote to then Health Minister Alan Rock in September 1999, demanding that the government stop serving corporate interests and return instead to serving the public interest. During these years, Dr. Chopra and his colleagues were supported by PIPSC, the 36,000-member strong Professional Institute of the Public Service of Canada. “PIPSC scientists don’t squeak, they roar!,” their information pamphlet asserted, objecting to the pressures put onto Health Canada scientists to do the bidding of corporations and ignore the law. They also pointed to the increasing deregulation designed to accommodate corporate profits and undermine public safety. PIPSC expressed its outrage at gag orders imposed on Health Canada staffers, which even forbade them to publish in scientific journals. A precedent setting legal case in federal court occurred in September 2000 when Justice D. Tremblay-Lamer ruled that Health Canada could not place gag orders on scientists because a civil servant is responsible to the public, not the government of the day. Equally helpful were the media whose relentless exposés exasperated many politicians of the day. The conflict between assessment and management is the key which ultimately led to Chopra, Haydon and Lambert being fired on July 14, 2004 for “insubordination.” In a nutshell: if health policy is governed by management instead of risk, abnormal drug test findings can be ignored. Drug assessment requires investigating how the liver, especially in rats, reacts to a new chemical compound. If liver enzyme production signals toxicity, the proposed drug is too dangerous. Rats are endowed by nature to metabolize/detox tremendously harmful compounds which other test animals, such as mice whose enzyme system is virtually identical to humans, can never survive. Dr. Haydon, for example, delayed the Bovine Growth Hormone application by nine years because Monsanto would not provide the legally mandated rat studies. Since Dr. Haydon already had some proof from scientific literature that this synthetic hormone not only caused mastitis in cows, but also birth defects in calves, this evidence would have been amplified had Monsanto complied with the mandatory rat studies. In 1994, her office was broken into and all her files were stolen. This event eventually led to a Senate investigation chaired by the late Eugene Whelan, starting on October 22, 1998. In an attempt to stop the truth on Bovine Growth Hormone from coming out, and knowing that a Senate’s subpoena to testify must be obeyed, the government “coached” Shiv and his colleagues on what to say at the hearing and ordered him to testify from a two-thirds blacked-out version of his own official report. When Dr. Chopra was sworn in at the Senate, he asked, “Which oath takes precedence? The one I just made to God or the one I made as an employee of the ministry?” Senator Eugene Whelan told him to “go with God” and the whole rotten story came out. That is why Canada does not currently allow the use of Bovine Growth Hormone, a proven carcinogen and endocrine disruptor. And that is why the European Union and other jurisdictions banned it too. 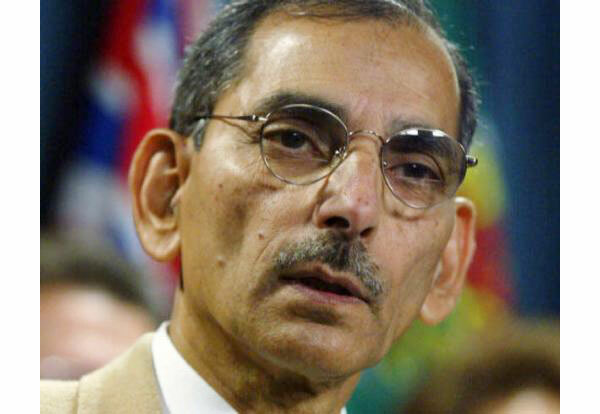 Shiv Chopra and Margaret Haydon did not get the Order of Canada for stopping Bovine Growth Hormone’s release into the Canadian food supply; they were fired instead. Being fired was a family affair at the Chopras. His wife, Dr. Nirmala Chopra, was head of the Pre-Marketing Review Section at Health Canada’s Bureau of Medical Devices from 1979 to 1993. She insisted on checking out immunological reactions to breast implants, but that legally-required satyagraha approach was inconvenient and she was fired. Today, about 300,000 women receive such implants annually in the US. Nirmala’s Health Canada story was documented in Nicholas Regush’s 1993 book Safety Last. Today, Dr. Kelsey [who saved American women from the drug Thalidomide in the 1950s] would probably also be fired because in 1995 the US passed “cost recovery” legislation. On January 6, 1996, Canada adopted the same, without parliamentary debate, in secret, through an Order in Council. This transferred the responsibility for drug safety and efficacy from Health Canada civil servants (mandated to act in the public interest) to the manufacturers of those drugs, thereby removing all independent oversight. Health Canada employees were informed that now their “client” was not the Canadian public “but the companies” applying for drug approval documentation. To safeguard against another Margaret Haydon, time limits were placed on regulators reviewing drug applications. This regulatory abomination is still in place and was followed up in 2003 with the so-called ‘Report on Plans and Priorities’ which absurdly opined that the Food and Drugs Act has “too narrow a focus on safety … and does not allow for taking into account considerations other than safety in managing health risk.” What was needed, said this report, was “to unleash business energies and reduce the regulatory burden on business.” Adding insult to injury, this report was followed up by “Health and Safety First,” the government’s plan describing “a higher level of protection” by revamping the Food and Drugs Act such that drug manufacturers would be completely protected against all possible liability once their products passed into the market. Prime Minister Harper tried to make this happen with the infamous Bill C-51 in 2008. This enraged me so much that I published a book entitled What Part of No! Don’t They Understand? The first two copies, hot off the press, were personally handed to Harper. Then Shiv and I lectured on that proposed Bill in many venues, helping to put the breaks on it – for awhile. During the time that Shiv and his colleagues were fighting to protect us from cancer- causing, hormone-disrupting and antibiotic resistance-producing drugs, other scandals hit the world scene. For example, in 2004, FDA regulator Dr. David Graham started blowing the whistle about hundreds of thousands of deaths from Vioxx. And University of Toronto’s Dr. Nancy Olivieri refused to obey Apotex’s order to exclude “known liver failure” from patient medication consent forms. In 2017, the United Nations declared antibiotic resistance to be the greatest unfolding global health disaster, mainly due to antibiotic overuse in food-producing animals. I am proud to have been Shiv’s friend for almost two decades and the publisher of his fantastic account of speaking truth to power: Corrupt to the Core: Memoirs of a Health Canada Whistleblower (2008). Having grown up in India myself, my visits to Shiv and Nirmala were always a bit like coming home. While Shiv cracked open cardamom pods for our chai, I took notes on background for upcoming events in courts and before Senate committees as the battle for safe drugs and food progressed. Shiv gave us the perfect blueprint on how to achieve food safety because he said, “It is our divine right … to eat and feed our families the food that the earth produces naturally.” His “Five Pillars of Food Safety” demand: 1) No pesticides; 2) No GMOs; 3) No animal hormones; 4) No animal antibiotics; 5) No rendered animal protein feeds. All of us who eat owe a big debt of gratitude to Shiv Chopra for his scientific rigour and personal integrity. John Horgan on the record: is he walking his talk? Dear Helke Ferrie, Would you like to participate in a tribute to Shiv Chopra on the radio? If so please contact me at http://tinyurl.com/VaccineFreeNYC. Corrupt to the Core Book was published in 2009 and the updated E-Book PDF version was published in 2016. Correction on the birth date. It was 1933.